An unusual and delightfully bawdy offering from the irrepressible Lucie Skeaping and her collaborators The City Waites. Today we think of a jig as simply a dance, but in late sixteenth- and early seventeenth-century England the word was used to describe a short musical farce featuring songs, dancing and slapstick comedy. By 1590 Jigs were thoroughly established in the London theatres as the standard ending or Afterpiece to more serious theatrical fare; they could be satirical, sentimental, libellous, riotous and often downright obscene, offering a shameless and frequently subversive antidote to the plays which preceded them. The characters are cuckolded husbands, adulterous wives, milkmaids, whores, city wide-boys, muggers and thieves, the plots often taken from folk tales but updated for city audiences with slapstick and comic twists of fate. These jigs all appear here in their premiere recordings. In committing these works to disc for the first time, Lucie Skeaping has given us a unique and tantalising glimpse of theatrical history. Artfully presented and recorded, they contain all the quick-fire banter, robust language and delight in linguistic play that marked the age, all set to some of the most delightful popular tunes England has ever produced. An entertaining cameo from Catherine Bott is among the many uproarious performances. The queint comedians of our time, that when their Play is donne, do fal to ryme. Today we think of a Jig as simply a dance, but in late sixteenth- and early seventeenth-century England the word was used to describe a short musical farce featuring songs, dancing and slapstick comedy. 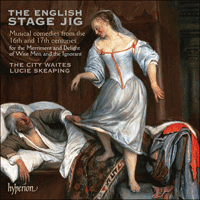 By 1590 Jigs were thoroughly established in the London theatres as the standard ending or Afterpiece to more serious theatrical fare; they could be satirical, sentimental, libellous, riotous and often downright obscene, offering a shameless and frequently subversive antidote to the plays which preceded them: ‘I have often seene after the finishing of some worthy tradjedy or catastrophe in the open theatres, that the scene after the Epilogue hath beene more blacke about a nasty bawdy jigge, than the most horrid scene in the play was’ (Thomas Dekker, 1613). The history of the stage Jig is a complex one but it is likely its origins are to be found in the oral tradition, in the dancing, clowning and misrule of the carnivals, May Games and festivals held in rural communities from earliest times. As these local entertainments moved into professional hands, the term came to be used to describe anything from a solo song, dialogue ballad or dance, to a full-blown mini-drama. Cuckolded husbands, adulterous wives, milkmaids, whores, city wide-boys, muggers and thieves—the same stock characters turn up again and again. We also meet lecherous soldiers, fishwives and a variety of street traders who, as they call out their wares, get drawn into the plot. One of the most popular characters—and often the unwitting hero of the piece—was the gullible Bumpkin who, with his country dialect, was a constant source of ridicule for urban audiences. The two most celebrated performers of Jigs were themselves strongly associated with the folk tradition. Richard Tarlton (1530?–1588) was a comedian whose stage persona was frequently that of a Country Clown. He was said to ‘love the Maypole with his heart’ and often made his stage entrance ‘attired in russet with a buttoned cap at his head’ playing the pipe and tabor, instruments characteristic of a folk dancer. Whilst none of Tarlton’s own Jigs survive, those of his successor Will Kemp have fared better. Kemp, clown in Shakespeare’s company, described himself as one ‘that hath spent his life in mad jigs and merry jests’ and is famously documented as having danced a jig all the way from London to Norwich. With their delight in innuendo and rude gestures, Jigs seem to have been a source of continual trouble to the authorities and disapproval from the literary world. One can imagine the titillating movements employed by Moll as she flirts with Wat and invites him to ‘Tickle Yard’ with the promise: ‘I can nimbly come above, I can tumble under’. Robin’s mother’s advice on courting is similarly down to earth: ‘Tak thee a lockrum napkin, son, To wipe thy snotty nose’ / ROBIN: ‘T’s noe matter vor that—chill snort it out, And vlurt it athwart my cloths’. So too are Simpkin’s comments as the adulterous Wife searches for a place to hide her lover, Bluster—WIFE: ‘I have a place behind here Which yet is known to no man’ / SIMPKIN: ‘She has a place before, too, But that is all too common!’—and his delight in the ensuing chaos: ‘I laugh now till I piss’. Wat’s reaction on finding a baby (‘It … zmells zo of mace, That I’m zure it was got by zome zarzhant’) was clearly directed at the city dignitaries who made up the audience at the first performance at London’s Mansion House. Ben Jonson loathed the ‘concupiscence of jigs and dances’, believing they prevented audiences from appreciating plays; Hamlet, after expounding some particularly vulgar dialogue, calls himself ‘Your only jig-maker’. In his Skialetheia (1598) the satirical poet Edward Guilpin dismissed the ‘whores, bedles, bawds and sergeants’ who ‘filthily chant Kemps Jigge’, noting how, on leaving the playhouse fired up with lust, ‘many a cold grey-beard citizen’ would sneak into ‘some odde noted house of sin’—easy to do as theatres, bearbaiting pits and brothels were situated close together on London’s south bank, outside the formal control of the city authorities. By 1612 Jig performances had begun to attract so many criminals and disorderly crowds—who often visited the theatre for the Jig alone with no intention of seeing the main play (‘He’s for a jig or a tale of bawdry, or he sleeps’, Hamlet, Act II, Scene ii)—that ‘An Order for supressinge of jigges att the ende of playes’ was issued, with instructions to arrest any players who ‘do persist in these outrages’. But the effect was temporary. Audiences, educated and ignorant alike, still demanded their Jigs and during the years of the Interregnum, when the performance of plays was illegal, the Jig came into its own (music and dance acts were not covered by this law), drawing riotous holiday crowds to the makeshift stages at fairs and the temporary booths at Bankside. Jigs were set to popular tunes of the day and, apart from the few short sections of spoken text, one can assume they were generally through-sung. Lines ending in ‘fa la la’ naturally indicate singing, and the introductions of new verse-patterns in the texts correspond to printed instructions such as ‘The Tune Alters’ or ‘The Tune Changeth’. Among the surviving Jigs the number of tunes for each ranges from one to eleven. Of the Jigs recorded here, only The Merry Wooing of Robin and Joan and The Bloody Battle at Billingsgate print the titles of the tunes to which they should be sung. However, where specific tune titles are not given, the text itself can offer clues: in The Black Man Thumpkin’s first song, beginning ‘As ye came from Walsingham’, is clearly a reference to the tune known as ‘Walsingham’; likewise, his song beginning ‘Jog on’ implies the popular tune of that name, whilst Wat’s refrain ‘Which no body can deny’ recalls a ballad associated with the tune ‘Cavalilly Man’, a version of ‘Greensleeves’. Where no connections are obvious, I have researched suitable tunes from contemporary collections including Playford’s The English Dancing Master, the Fitzwilliam Virginal Book, lute and viol anthologies and Claude Simpson’s The British Broadside Ballad and its Music (1966). We can never know for certain when the performers ignored the sung metre or spoke the lines over the tune, since many of the original texts were not written down in verse form. Therefore, in order to create performable versions of the Jigs with music, it has been necessary to make one or two minor changes to the text. As far as possible, original spellings, however inconsistent, have been retained although in a few cases words have been adjusted to aid understanding. We know little about the nature of the dancing in Jigs. Indications are few and seldom definite as to how and where any dancing or dance interludes may have occurred. Indeed, the actors may well have danced at the same time as they sang, perhaps combining rhythmic moves with elements of mime to emphasize the story-telling: ‘The players mean to put their legs to it as well as their tongues’ (Donald Lupton, 1632). However, as Jigs expanded into more sophisticated song dramas such as The Cheaters Cheated we find instructions, for example ‘Both dance to their own singing’ and ‘She singeth and danceth’. For the choice of instruments I have looked to those commonly heard in the theatre, tavern and village green of the period. Parts for cittern, recorder and bass viol for a ‘Tarltons Jigge’ are found in manuscript in Cambridge University Library, and Tarlton himself is famously pictured playing the pipe and tabor. In The Elizabethan Jig (1929), C R Baskervill notes an account of an English troupe performing in Germany in 1599 as having lutes, citterns, fiddles and pipes, while Shakespeare’s Bottom the Weaver (‘I have a reasonable good ear in music. Let’s have the tongs and the bones’) has partly inspired our choice of percussion! The many references to dancing suggest a band large enough to make a lusty sound, especially if we take into account a noisy audience, and an open-air environment. After the Restoration, Jigs found a place at civic functions and livery feasts, and occasionally between acts in the indoor theatres, but by the end of the seventeenth century, under the censure of moral respectability, they had fallen into decline. However, their influence continued to reverberate in Purcell’s semi operas and John Rich’s pantomimes and ballad operas. Theatre managers such as David Garrick customarily propped up a faltering play with a popular Afterpiece, and the spirit of the Jig can still be perceived in today’s Christmas pantomimes with their stock characters, dancing and slapstick. Fewer than a dozen English Jig texts survive, some damaged or incomplete. However, more have survived in Dutch and German, many almost certainly translations or adaptions of English Jigs exported by travelling players whose original English versions are lost. During 1585–7 Kemp and his colleagues toured Holland, Germany and Denmark where their repertoire had a powerful influence on the development of continental Singspiel. The texts are laden with period references, innuendo and contemporary underworld cant, some of which need more explanation than a CD booklet can offer. What went on between the lines, though—the bawdy gestures, dance steps, instrumental interludes and improvised spoken ‘asides’—belonged to each individual performer, much like the ornamentation in a baroque concerto. With so little surviving information, we can only guess.